Título: Home is Where the Heart Is Built Environments of Expatriate Artists in Spain. Autora: Jo Farb Hernández. Directora del archivo SPACES y profesora en el departamento de arte y historia de arte en la Universidad Estatal de California, en San José. Currículum académico: Jo Farb Hernández es directora de la Galería de Arte Thompson y profesora en el departamento de arte y historia de arte en la Universidad Estatal de California, en San José. Asimismo es directora del archivo SPACES – Salvar y Preservar los Artes y Entornos Culturales – cuyo principal propósito es el de documentar y preservar los entornos de arte brut y las artes autodidactas en un ámbito global. Autora o coautora de libros y catálogos de exposiciones de arte, publica artículos en numerosas revistas internacionales. Su interés principal se centra en el estudio de los entornos de arte brut y ha realizado trabajos de campo in-situ sobre este tema desde el año 1974. Colabora como editora contribuyente en la revista británica Raw Vision y en 2013 ha publicado con la misma editorial Raw Vision su libro Singular Spaces: From the Eccentric to the Extraordinary in Spanish Art Environments [Espacios Singulares: Desde lo excéntrico a lo extraordinario en los entornos de arte brut en España]. Resumen: Los entornos de arte creados por artistas autodidactas están vinculados de manera específica al sitio en el que están ensamblados de maneras que no suelen igualarse con otras obras de arte o construcciones arquitectónicas. La mayoría de los creadores construyen en o cerca de sus casas o tierras natales, y su trabajo refleja conexiones profundas y a menudo históricas con esta propiedad. Sin embargo, de vez en cuando hay expatriados que se vincularán tan estrechamente con su tierra de adopción que se inspiran a expresarse en una respuesta material y monumental a sus nuevas visiones y experiencias. En este artículo, examino el trabajo de cuatro expatriados artista-constructores de entornos de arte en España, mientras presento sus obras únicas y exploro las formas en que las geolocalizaciones adoptadas pueden haber estimulado, modificado o proporcionado un motivo para su trabajo. Al hacerlo, propongo que la creación de estos entornos de arte idiosincrásicos ofrece una oportunidad clásica para la participación simultánea de sus constructores en la exploración cultural y el autodescubrimiento personal. Palabras clave: expatriados, artista-constructores, entornos, arte, España. 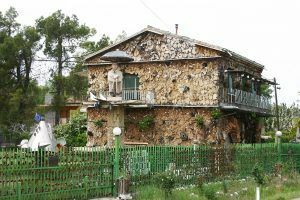 Abstract: Environments created by self-taught artist-builders are site-specifically linked to the location on which they are assembled in ways not typically equaled by other art or architectural constructions. Most creators build on or near their natal homes or lands, and their work reflects deep and often historical connections to this property. However, occasionally expatriates will bond so closely to their adopted land that they are inspired to express themselves in a monumental material response to its novel sights and experiences. 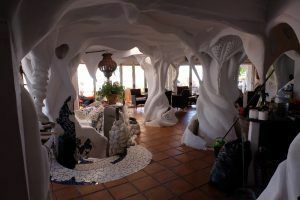 In this article I examine the work of four expatriate artist-builders of art environments in Spain, as I present their unique oeuvres and explore ways in which their adopted geolocations may have stimulated, modified, or provided purpose for their work. In so doing, I propose that the creation of these idiosyncratic art environments affords a classic opportunity for their builders to simultaneously involve themselves in cultural exploration and personal self-discovery. 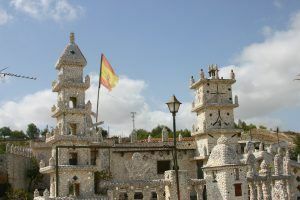 Keyword: expatriate, artist-builders, art environments, Spain. 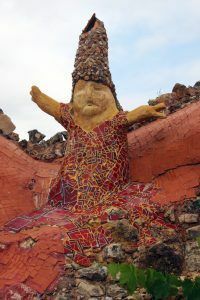 Texto: Art environments are extraordinary and often elaborate site-specific examples of constructions that convey a creator-builder’s connection to a particular location. Most of these built compositions – monumental in scale or number of components – typically reveal a familial if not natal link to these settings; they may be built in or around the house where the creator was born, the one into which s/he moved when beginning married life, or perhaps one inherited from relations. Alternatively, they may be located on an agricultural or business property where a lifetime’s livelihood was practiced, or even on a special but appropriated place to which the creator felt a pronounced spiritual or romantic or even ludic link. Whatever the variant, the art environment is born and nurtured in a place that is lived, a place of calm or comfort or sanctuary, a homeground. 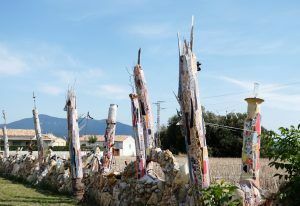 Imágenes: José Foncillas Ribera, Barbastro (Aragón), 2008; Josep Sala i Prat, La Granja, Borrassà (Catalunya), 2007; Josep Pujiula i Vila, El Poblat Salvatge, Argelaguer (Catalunya), 2016. Such concepts of place have had significant historical resonance. 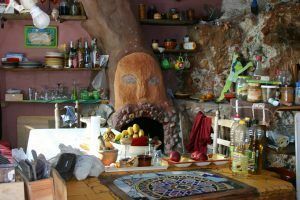 Numerous folklorists have noted the importance of place in the development of a sense of self and community, and how the physical attributes of the creator’s surroundings play an important role in shaping creative output. It goes without saying that the link one feels to one’s home, while abstract, is almost visceral, and one that engages all the senses: there is a special smell, an innate sense of how the air feels, an intuitive understanding of how words roll off the tongues of one’s neighbors. It is not uncommon, therefore, for constructors of art environments to refer to and reflect elements of that homeground as part of what they build, in numerous ways on numerous levels, as they explore and materially recount the memories, customs, and experiences that have made them who they are. 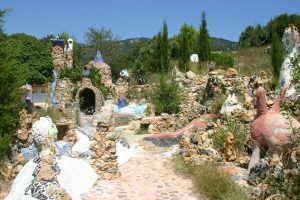 Intimately linked to their creator in a way generally unmatched in any other circumstances of art-making, architecture, or landscaping, these sites are developed through an additive and organic process of creation, without formal architectural designs or engineering plans. They draw their power not only from the innovative multi-dimensionality of the interaction of the discrete elements, an experiential interface that creates a potency that is significantly dissipated if discrete works are removed or the site is demolished, but also, in its very essence, a potency that emanates from the spatial and cultural context of that particular site itself. 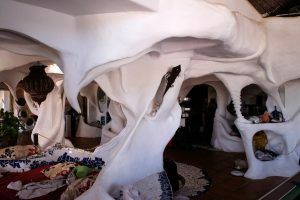 In a very real sense, the intimate connection the artist has to the site provides the seed from which the constructions grow. But what if one’s natal home is far away? How does the sense of place imbued in one who is native to a given area differ from that experienced by one who has chosen to change his or her domicile, region, or even country? The answer, of course, differs between and among artists, but it is not uncommon for the newly-adopted land to play an important role in inspiring creation – if not actually providing intention and purpose for the creation itself – in a way not unlike that which might have been played by the artist’s original homeground. 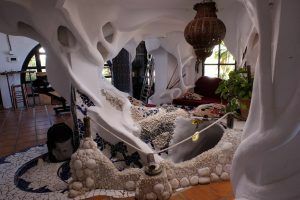 In this article I will examine the work of four expatriate artist-builders of art environments in Spain, as I present their unique oeuvres and explore ways in which their adopted geolocation may have stimulated, modified, or provided purpose for their work. I have found that the subject matter of Hans Schnitzler was directly related to the pleasure he took in the sun and sea, and to the new sights he saw near his seaside home; Freddie Zuidijk’s constructions meld interior and exterior spaces in a celebration of a way of living wildly different from that of his native Holland; Peter Buch’s work fuses with the mountainous rises and gullies of his inland garden in such a symbiotic way that the fabricated and the naturally-occurring are sometimes confused; and the work of Manfred Gnädinger was not only physically created from the natural and found materials he discovered washed up on the shores of the rocky promontory he claimed for his own on the point of the Cantabrian Sea, but, further, his very identity melded with this place and, after his death, the identity of the place itself became inseparable from his own. 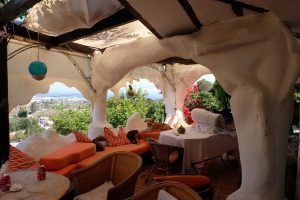 Spain has welcomed its share of expatriates and long-term visitors over the years; especially near the coasts one finds numerous natives of the northern climes, enjoying the plentiful sun and sea. 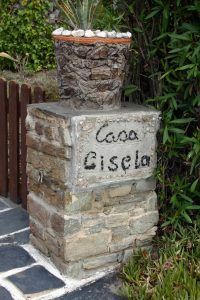 Many have purchased homes and come here year after year, and although some become fully integrated into their new Spanish lives, others live somewhat apart, not learning the language and not mingling with the locals, but seeking out their compatriots and reconstructing a somewhat parallel life in Spain to the one they left behind. Yet even these types of residents are not immune—nor presumably do they want to be—from the images or attitudes of their adopted land, and they may practice a blended style of living, informed by the ambience and textures that are so different from what they knew at home. Hans Schnitzler was born in Koblenz, Germany, near Bonn. He was a baker, so he was used to working with dough, adding the right ingredients and mixing them until they reached the desired consistency. He married Gisela and, by 1968, they began to travel to Spain for vacations. 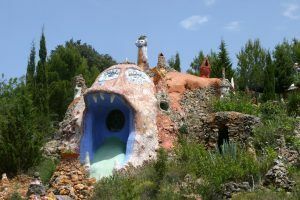 Unlike some of their compatriots, they chose not to explore far down the southern coasts, but were happy to spend their time on the Costa Brava, just a few miles south of the French border. In 1973, the Schnitzlers purchased a house with a bit of land on a curve in the coastal road, the first house in a new urbanización [subdivision] on the outskirts of the fishing village of Port de la Selva, a development in which all of the homes were being sold to foreigners. As they began to make the new house their home, they started planting a garden on the adjoining land. Although Catalunya receives considerably more rain than most parts of Spain, it certainly does not receive as much as the Schnitzlers were used to in Germany. 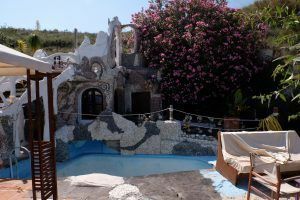 So Schnitzler began to construct small planters to try to conserve the water that was available, making use of the rocks extracted from the topsoil as his primary building material. 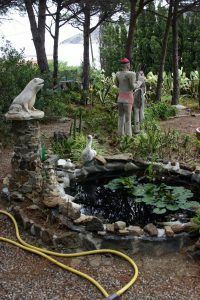 They terraced the garden area, crisscrossed it with stone or gravel stairs and paths, added a small pond, and cultivated many different kinds of flowering and native plants. 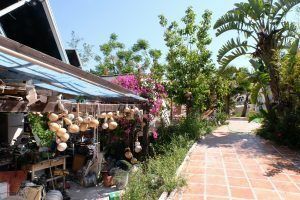 Underneath the pine trees and overlooking the sea, they also installed a small lawn-bowling court, as well as a lane for hitting golf balls. 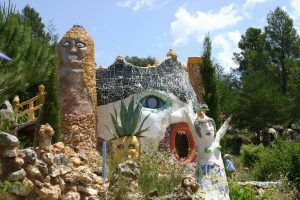 Around 1996, Schnitzler began to expand his manual efforts from the various planters and flower boxes scattered around the site to objects that were more sculptural. 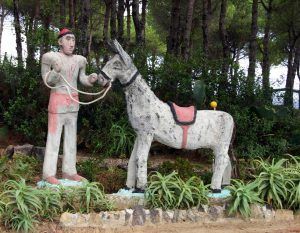 Perhaps in an attempt to emphasize the differences in daily life that he saw between Spain and Germany—particularly those reminiscent of his early years in Spain—his first concrete work was a burro at three-fourths scale with reins that were held by a separate sculpture of a full-scale Catalan peasant, replete with red barretina-like cap. The figure also wore a painted pink belt and shoes, and the burro had a painted pink saddle. 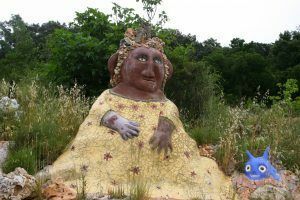 Both figures were stiff, but not without grace, and were completed in the spring of 2005; added for amusement and decoration, they were located just to the side of the small-scale lawn-bowling and golf courts. 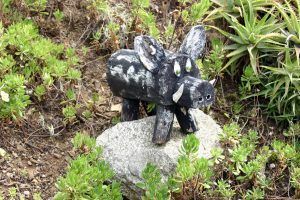 A painted wooden boar created from tree trunks, concrete seagulls, ornamented columns, and more complemented the almost Pop Art-style concrete planters with their exaggeratedly huge concrete flowers. 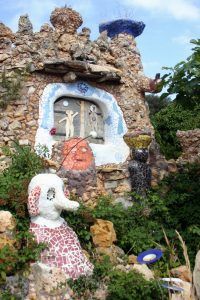 Although this art environment is no longer extant – the Schnitzlers moved back to Germany around 2014 and the new owner removed most of the more unusual decorative elements – it was clear, not only from the obvious love that the couple manifested in caring for and ornamenting their garden, but also from the little painted sign that he had hung over a little outdoor garden shelter—“Meer und sonne el paradieso [Sea and sun are paradise],” that this little corner of Catalunya had surpassed the original idea of a casual seaside getaway and had become a visceral part of their very beings. A baker without training in art, Hans Schnitzler was nevertheless so inspired by his surroundings that he was moved to try to reproduce some of the images that best epitomized his new Spanish life. And, through this work, although he spoke neither Spanish nor Catalan, he was still able to express his pleasure at the life he and Gisela had made on this faraway coast. Born in windy, rainy northern Holland, Freddie moved with his family as they followed his father’s service in the diplomatic corps; by age 19, he landed in London, following a girlfriend who would later become his wife. Although he had wanted to study architecture in America, he changed his focus to be with her, and instead earned a degree in economics. These studies no doubt helped him to become a successful businessman and restauranteur, but he ultimately cashed out of his London businesses and apartment and moved to Spain in 1990. 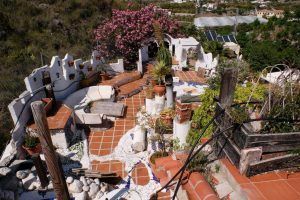 Using the sales proceeds, he bought a small house on a two-third acre plot in the mountains overlooking a tourist village on Spain’s Costa del Sol. But he became involved in new businesses down in town; again, they were successful, and although his plan was to fix up the house, between his then-dubious construction skills, distractions from his town businesses, and too much partying, he only worked on the house periodically, leaving it open to the elements when he was away, so much of the early work later needed to be ripped out and redone. 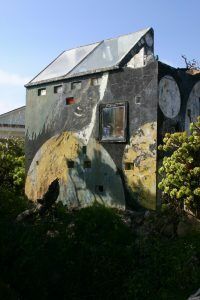 Around 2005 Zuidijk moved permanently up to the hill and began to devote all his time and energy to transforming the tiny three-room cabin. 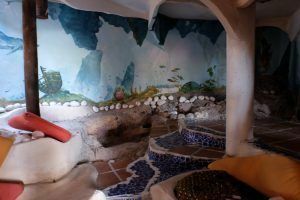 He was attracted by the rocky landscape, and wanted to incorporate some of the natural elements into his work, so he knocked out walls and made the low rocks part of the interior footprint of his construction rather than leaving them outside. 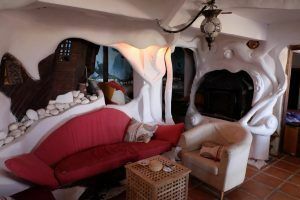 He added trencadís designs and also, to an ever-increasing extent, carved plaster elements, changing the shape of walls, ceilings, and rooms. A friend who was a master plasterer showed him the basics, and Zuidijk has now become an unofficial master himself. He wraps an infrastructure of metal rods with chicken wire to form his desired shape, and then piles on the plaster. 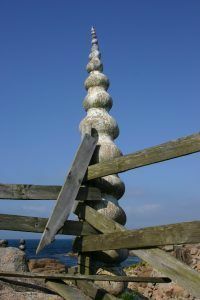 These decorative elements are all solid, so as to avoid interior cavities into which rodents might crawl and nest; when he realized that the weight might tax the foundation of the house, he reinforced it rather than change the manner in which he works. The house is a work in progress, but it already shows remarkable ingenuity and an increasing refinement. While the lines of the house itself are rectilinear, his ornamentations are all organic, with undulating shapes and contoured edges. There is a constant flow between exterior and interior, with numerous welcoming areas for sitting and relaxing. He has learned to be as precise as possible in the early stages of his plaster work, and then, after letting these structures dry for two or three days, he returns to carve them, adding to their intricacy. 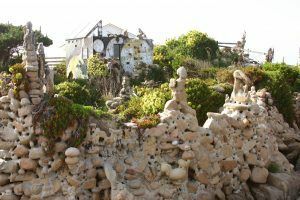 Having already paid a fine for terracing his garden areas and building without a permit, Zuidijk is fearful of again drawing the attention of the authorities. So, for example, he no longer picks up stones and found objects from the beach, thinking that if the police were to see him gathering the materials, they would know that he was going to use them in construction. 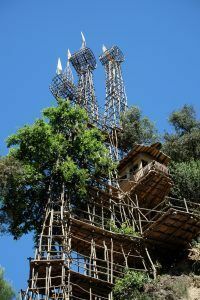 And while the regional government is willing to legalize illegal structures, the costs of requesting a permit and then having all work done by a licensed professional – rather than allowing him to give free rein to his own creativity – is too much for him to contemplate. So he continues to build furtively, consumed and energized by the work he is doing, yet fearful of attracting unwanted attention. 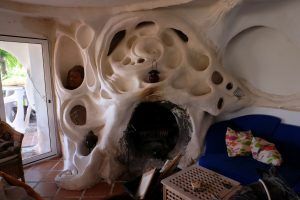 In some ways, Zuidijk’s constructions – while indubitably inspired by the mountainous landscape and the ability to live both outdoors and indoors during most of the year, thanks to the delightful Mediterranean climate – appear less driven by his specific geolocation than by a personal aesthetic whose manifestations could easily enhance an artist’s home in Los Angeles, Nice, or Palermo. While one would assume that his unrequited interest in architecture may have had some influence, when the parts of his constructions are examined chronologically, it is clear that the more radical components are those that developed later – in other words, that it was his own work that inspired him to push the envelope further and further as he built, rather than the influence of architectural or sculptural work by others. This may be a result, perhaps, of the dominance of the interior decoration, in contrast to – at least as of this writing – the somewhat less unusual exterior elements of decks, terraces, and even the amphitheatre. 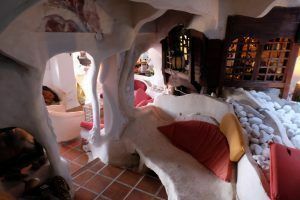 And while nothing about this site is either conventional or predictable, it seems likely that this particular expat might have created a similarly idiosyncratic environment if he had landed in another similarly promising place. 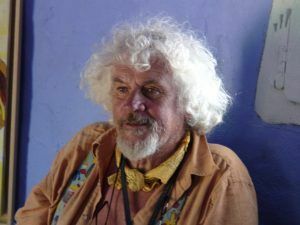 Peter Buch was one of the “hippies” from the northern countries who was lured to Spain by the promise of sun-drenched beaches during the 1960s and ‘70s, a strategy conscientiously developed by Franco’s government in order to bring hard cash into the country, thus helping to counter the devastating economic effects of their failed policies of autarky. Buch was born in Frankfurt, Germany, one year prior to the beginning of World War II, to a family that had lost its wealth and power due to its resistance to the growing threat of the Nazi regime. Despite the upheaval in his native country, he had taken some art classes as a youth and for a while fancied the idea of becoming a “famous painter,” but he was expelled from art school for what his teachers described as a lack of discipline, but what, no doubt, was probably more a rebellion against their strictly academic styles of teaching. Nevertheless, he continued to paint and draw on his own, and while aware of the mainstream contemporary art world, he now generally pays it little attention, and is not particularly current in his knowledge of or interest in trends and genres. 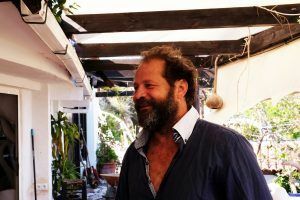 Working alone, over time he developed his own artistic vocabulary, colorful imagistic yet fantastical beings that he spun out in between partying and working as a house painter on the island of Formentera. 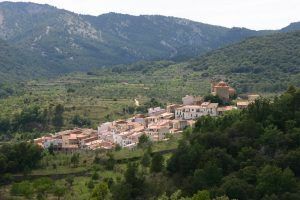 But as the island life was becoming increasingly subverted by wealthy jet-setters, he felt the need to escape further to someplace more isolated and tranquil, so in the mid-1980s he purchased some property in the mountains of Castelló province on the Spanish mainland. 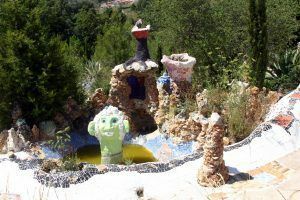 Although Buch’s short-lived academic training had been in painting, by 1991 the rocky landscape of the mountain village of Pobla de Benifassà began to inspire him to invest more energy into three-dimensional works. 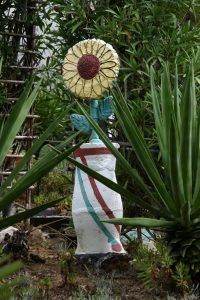 Putting in a garden on some additional property he purchased just slightly outside of the village’s municipal limits, he began to add sculptures, one by one, between the planted areas, boldly initiating a process of transforming the space with color, form, and texture. 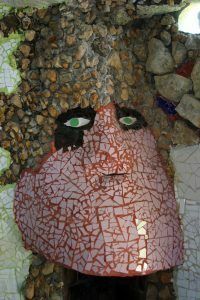 Much of the raw material he uses—rocks and stones in various colors and hardness—is found on-site, and he has taken advantage of their different properties to create a diverse range of both purely aesthetic and aesthetically functional works. 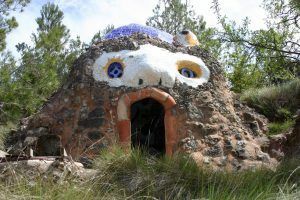 Integrating his artistic expression with the land’s topography, fig 31he started creating small figures, animals, and even buildings, using the imagistic vocabulary he had developed as a painter, working without a plan and not knowing what he would do until he was actually doing it. 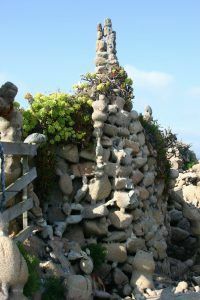 Using simple hand tools such as shovels, picks, and trowels, he built up walls with the rocks, adding earth and small stones to set them and smooth out the shapes. 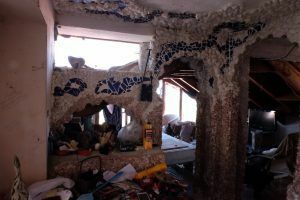 He then covered the infrastructure with concrete, adding bits of broken tiles that he found in the trash or that friends brought to him to ornament the structures. 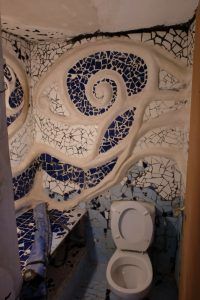 He had seen the works of Antoni Gaudí during an early visit to Barcelona, but at the time he saw them, he considered himself a painter and was not inspired to explore making art in a similar vein. 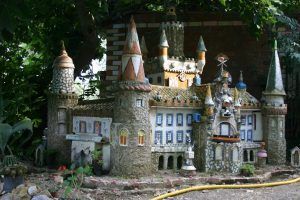 In contrast, he credits some idiosyncratic structures he saw during a visit to California in the early 1980s with sparking the idea to expand his own artistic endeavors in its present direction: now, he freely references not only Gaudí, but Ferdinand Cheval (Le Palais Idéal, Hauterives, France), Raymond Isidore (Picassiette, Chartres, France), the gardens of Niki de Saint-Phalle (such as the Giardino del Tarocchi in Garavicchio, Tuscany or Queen Califa’s Magic Circle in Escondido, California), and the sixteenth-century Sacred Forest of Bomarzo in his work. 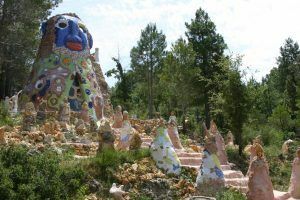 Buch’s own works are lively and humorous, and he has created an extensive, whimsical environment, transforming the original look of the site: the Garden is peopled with engaging characters and amusing invented creatures, all linked by an interlocking series of pathways, ponds, and flowering gardens. And although his own visual vocabulary and personal style is ubiquitous, each work is approached uniquely and with an aesthetic freedom that enables them to all appear fresh and compelling. He works at an unhurried but consistently determined pace, crucial to the realization of such a variety and quantity of works. 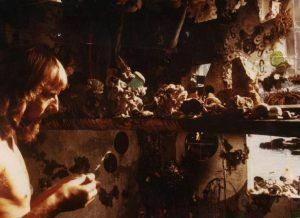 He also typically works on more than one piece in more than one part of the Garden at once: rather than starting in one spot and systematically working out from there, Buch chooses to respond to different sections of the property at different times, following his inspiration and taking advantage of the raw materials he has on hand. As such, he has made a wide mark on the entire site at once, in a manner both audacious and ambitious. 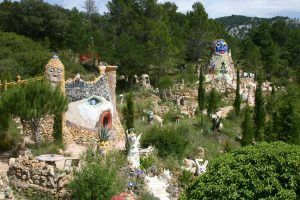 When he bought the land, he thought that he would construct a few “bigger things” on it, but he certainly had no concept of the extent to which he would push his creations; as of summer 2014, ten buildings and hundreds of animals and figures populated the mountainside site, and the Garden becomes denser with new works every day. There is no doubt that Buch’s work is inspired by the topographical variations of the landscape as much as by his own artistic vision; the fluctuations of the geography, both vertically and horizontally, both cradle and support his artistic explorations: he shapes new spaces as he responds to the existing zones. But yet while he works with the expanses and the crevices, the gullies and the rocky knolls, he pushes beyond a simple wrapping of the landscape in his imposed materials. It is clear that his improvisationally-designed spaces are not dependent solely on the natural features of the site: as the site evolved, Buch intuitively positioned the various types of components so as to balance each other. Monumental buildings anchor central sections as well as boundary areas, providing visual interest with changes in height and drawing the eye across the terrain; these imposing markers are offset by the sunken basins of the many ornamented ponds, also spread around the property in a manner that, while seemingly randomly placed, seem to punctuate the dryness of the hillsides at just the right points. Although a visit to the Garden provides a consistent string of visual surprises—including, regularly, initial confusions between the real and the fabricated, a hallmark of postmodern spaces—and pictorial consistency is also achieved through the connections provided by his personal imagistic vocabulary, the sense of balance realized by Buch across so many diverse creations is unmistakably the result of an almost visceral personal relationship with the landscape that has been developed over years of living and working on site. His work not only has come to encompass the existing site of the Garden, but has pushed the spatial limits of that site, forming a self-contained physical world that goes far beyond the material representations of invented spaces created by most artists. Imagen: Courtesy Fundación Man, Camelle. Manfred Gnädinger was not markedly different from other young bourgeoisie who traveled to the far corners of the earth to find a simpler, more “authentic,” and tranquil existence. Born in the Black Forest village of Radolfzell in the Konstanz district in southwestern Germany, he faced first personal and then economic difficulties as he grew to young adulthood in the years immediately following the second World War. Leaving his family and a girlfriend behind, he headed south to Spain. First stopping in other northwestern Galician towns, he ended up in the small coastal village of Camelle (A Coruña) in 1961 or 1962. In those days, very few foreigners or tourists made their way to this insular village of about 1,000 residents on this wild and windswept Costa da Morte; those who did were usually religious pilgrims on their way to the inland cathedral of Santiago de Compostela, about 76 kilometers to the southeast, so the locals—most of whom eked out a rough subsistence from gathering the percebe mollusk or fishing the coastal waters—did what they could to welcome him, providing him with a bit of food and a place for the night. Soon, however, they realized that he had come to stay. Clean-shaven and well-dressed, with his hair always well combed, at first he led a conservative life. Soon, however, he fell in love with a local teacher. Devastated when she married another, by the end of the decade he had come to believe that a good part of human suffering was due to the desire for material goods, so he began to re-prioritize his life, moving toward bare and basic essentials in every aspect. He relocated to a small piece of property right on the rocky shore at the farthest edge of the village, which he later was able to purchase for the symbolic sum of one peseta, and exchanged his suit and button-down shirts for a loincloth, which he wore all year despite the generally cool temperatures and stormy weather of the Atlantic Coast. He renounced his passport and “normal” way of life, built a ramshackle shelter on the point with no electricity and no running water, grew a long beard, and became a hermit. He gave up use of his last name and became known as O Alemán [the German] or simply Man, appreciating the iconic symbolism of the nickname. He was generally accepted as a benign curiosity by the locals, and lived with the sea at his doorstep in this inhospitable but strikingly picturesque spot until November 2002, when the off-shore shipwreck of the tanker Prestige spilled 77,000 metric tons of oil, contaminating the coasts of Spain, Portugal, and France, killing innumerable fish and wildlife, and coating the beach and all his sculptures with the black, toxic slick. He died that next month, it was said, of grief. Man had spent much of his time constructing a “museum” on this site near the end of the earth (Finisterre). Although he had had no formal art training in Germany, he had visited Italy with the intention of viewing some of its renowned masterpieces, and he had pored over illustrated books and journals, doing some sketches and paintings in ways that emulated the great masters. 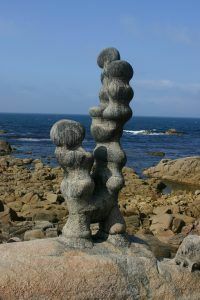 But when he began again to make art on this isolated and rocky stretch of the Cantabrian shoreline, his work no longer referred back to traditional art historical genres, media, or techniques. His new artwork now tended toward rather iconic shapes and forms, as well as toward straightforward manners of working, although the media was varied: with no tools but his two hands, he made use of the detritus washed up by the waves or tossed off the pier by fishermen or visitors to the coast. 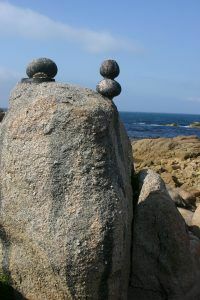 Almost all of the stones he chose to use were curvilinear or ovoid in shape; he took advantage of the natural forms of the wave-washed materials and consciously placed them to contrast with and complement the rocky outcroppings of the shore. 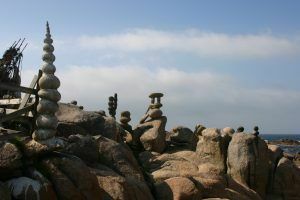 He piled the rounded stones on top of each other, cementing them together into globular pillars and columns, chains, and clusters. Many had the appearance of organic totems, elegant and spare in form, and almost spiritually potent; others took on the zoomorphic shapes of unreal or imagined creatures. Occasional animal bones—primarily cetacean vertebrae, but also skulls of sea birds or animals that had drowned—were added as well, as were lacings of rope, seaweed, and shore vegetation. Pieces of wooden barrels, tires, rags, nets, buoys, rusty metal fragments, and more rounded out his palette. As he went on a daily barefoot run, he was always on the lookout for interesting objects that he would find on his path, remembering to collect them on the way back home. Sometimes they were so large that he would retrieve them later, piling them into a small wooden cart. He arranged multi-leveled fountains out of rocks and found objects, using his knowledge of the tides to calculate how the basins would fill with water and filter down. 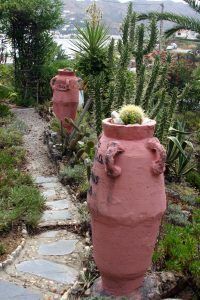 He also cultivated and encouraged indigenous plants to take root among the rocky crevices, so as to both complement and soften the effect of the jagged stones. He was fascinating to watch—an “action painter,” using the rocks and the waters’ debris as his media, the shore as his canvas. The villagers had no name for what he was doing—it certainly did not correspond to their ideas of what “Art” should look like—but it was clear that he seemed to have conceptualized these interventions as a means not only of delineating and transforming his space but of sanctifying it, as it enabled him to feel more connected to the natural forces surrounding him. 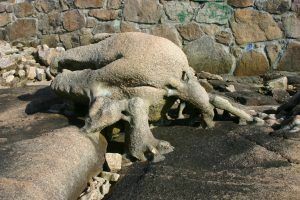 He called these stone sculptures his “hijos [children],” and he cared for them and conserved them as needed, replacing elements when the sea broke them down, filling cracks, and replanting vegetation. 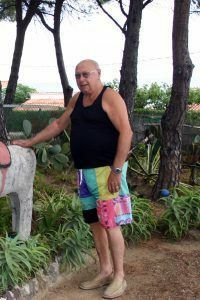 Manfred Gnädinger – a stranger to these parts who never really learned to speak Gallego or Spanish, and who never seemed to be interested in relinquishing his identification as a foreigner – nevertheless came to identify viscerally with his new home. Certainly, this was true during his lifetime: he became a vegetarian who ate only what he could grow on the rocky shore surrounding his house, supplemented with seaweed and algae he would gather from the sea, and, of course, his artwork was created from, constructed, and exhibited on those same few square meters. He could not have been more closely connected to what became the homeground for his art, and, indeed, for his very existence. And then, with his death, he became a symbol of the land itself, even to people who lived far from his tiny hamlet. With his thin, naked body, long hair and beard, and ascetic lifestyle, some compared him to Christ, and his death was seen as the sacrificial lamb upon the altar of ecological disaster. This association was strengthened because of the date of his death: December 28, the Day of the Holy Innocents in the Catholic calendar. He quickly became the symbol of the tragedy of the Prestige and the icon of the environmental movement, whose rallying cry was Nunca Maís [Never Again] and whose motto became “Todos somos Man [We are all Man].” This remains true as of this writing, fifteen years following his death. 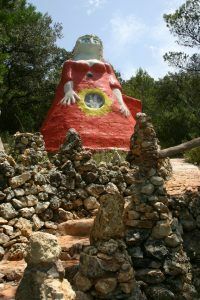 What irony that the personal space of a seeker who sought and found a place to inspire and support a quiet and simple existence – a place that became inseparable from both the body and the image of this artist – became a place that energized literally thousands of others, as well, as they honored and memorialized his name. In each of these cases, as is typical with immigrants, these expatriates were met with a certain degree of mistrustful curiosity upon their arrival, and they lived through an extended period during which social interaction was simplistic and superficial, as they were observed with some wariness by their neighbors (and simultaneously warily observed them in return). 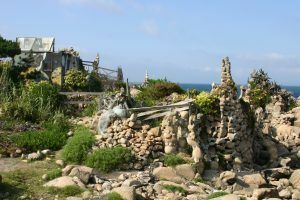 While three of the four chose rather isolated sites for their constructions that would have had less impact on their neighbors (Schnitzler being the outlier here, with his property facing the main coastal throughway fronting the sea), challenging the parameters of what these neighbors may have conceived of as “Art” – or even as garden decoration – would not seem to be a way to accommodate local comfort zones. Did this lack of deference to local indicators exacerbate the cultural isolation of these artists and their ability to adjust to their new homes, thus hindering cultural integration? It certainly seems unlikely to have promoted a particularly positive effect in dissolving typical ethnocentric attitudes or helping the artists move from simply being tolerated to being authentically accepted. But did it matter? Perhaps the intent was less to acculturate to their new communities than to facilitate and accelerate their own more personal adaptation to their new sites. Is it therefore possible that such active physical intervention helped moderate some of the personal disorientation typically felt by immigrants, even as it failed to assuage cultural tensions or promote social acculturation? Or were these environments, as we have seen in other cases, conceptualized as gifts to their newly-adopted communities that simply were not recognized as such? Imágenes: Hans Schnitzler, 2008; Manfred Gnädinger, 2008; Peter Buch, 2014; Freddie Zuidijk, 2016. The works and environments created by these four artists are markedly different from each other, and the ways that they learned from and responded to their chosen locations are significantly distinctive. Yet it remains noteworthy that an instinctive sense of place – even if it is not one’s homeground place – can be developed far from “home.” Drawing on imagery in the case of Schnitzler; sensation, in the case of Zuidijk; topography, as with Buch; or geography, as manifested by Gnädinger, strikingly affected their underlying conceptualizations as well as the materiality of their productions. For all four, immersion in a new geolocation provided a classic opportunity for simultaneous cultural exploration and personal self-discovery. While it is likely that no matter where they landed, each would have been stimulated to take control of his new space and place in a unique and idiosyncratic way, it likewise seems evident that the particular space and place they chose inspired site-specific responses that could never be duplicated elsewhere. A quote attributed to Pliny the Elder. Selections of this text were first published in my book Singular Spaces: From the Eccentric to the Extraordinary in Spanish Art Environments (Waterford, U.K.: Raw Vision, 2013). See, for example, Estyn E. Evans, “The Cultural Geographer and Folklife Research.” Folklore and Folklife, ed. Richard M. Dorson: 517-32. Chicago and London: University of Chicago Press, 1972; William Ferris, ed. Local Color: A Sense of Place in Folk Art. New York: McGraw Hill, 1982; and Edward Relph, Place and Placelessness. London: Pion, 1976. On-site documentation and field interviews with the artist and his wife took place August 14, 2008. For a more comprehensive treatment of Schnitzler’s work, see Singular Spaces: From the Eccentric to the Extraordinary in Spanish Art Environments (Waterford, U.K.: Raw Vision, 2013): 296-301 and, in Part II: 318-321. On-site documentation and field interviews with the artist took place May 20, 2016, with follow-up correspondence through the present. 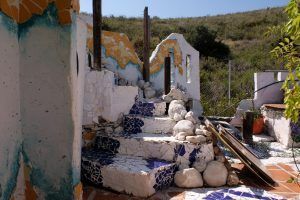 On-site documentation and field interviews with the artist took place April 17 and July 11-12, 2008; August 10, 2011; and June 21, 2014, supplemented by follow-up correspondence and exchange of images through 2012. For a more comprehensive treatment of Buch’s work, see Singular Spaces: From the Eccentric to the Extraordinary in Spanish Art Environments (Waterford, U.K.: Raw Vision, 2013): 336-351 and, in Part II: 362-403. On-site documentation took place June 11, 2008, complemented by email correspondence with numerous researchers through the present. For a more comprehensive treatment of Gnädinger’s work, see Singular Spaces: From the Eccentric to the Extraordinary in Spanish Art Environments (Waterford, U.K.: Raw Vision, 2013): 470-491 and, in Part II: 506-513. Aguado López, Clara. “¿Quién mató a Manfred?”, Cobeta.org (2003). http://www.cobeta.org/Nuestros%20Artistas/manfred.htm. Downloaded March 10, 2011. 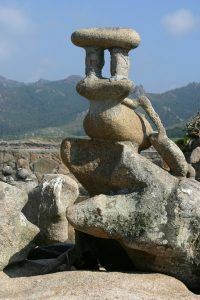 “Hermit sculptor ‘killed by oil spill.’” BBC News (December 29, 2002). http://news.bbc.co.uk/2/hi/europe/2613343.stm Downloaded March 3, 2011. Ducrocq, Isabelle. “L’homme qui est mort de chagrin.” France 5 (March 19, 2008). http://www.france5.fr/programmes/articles/sciences/636-l-homme-qui-est-mort-de-chagrin.php Downloaded March 3, 2010. Counter-intuitively, observance of this day has become almost like an April Fool’s Day in Spain; nevertheless, the original mournful sense of commemorating a massacre of innocent victims by King Herod is that which prevails in events surrounding the anniversary of Man’s death. –Farb Hernandez, Jo. 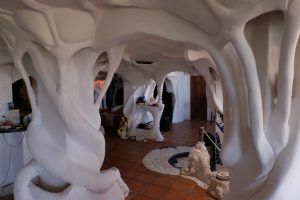 Singular Spaces: From the Eccentric to the Extraordinary in Spanish Art Environments. Waterford, U.K.: Raw Vision, 2013. -Evans, E. Estyn. “The Cultural Geographer and Folklife Research”, in Folklore and Folklife, ed. Richard M. Dorson. Chicago: University of Chicago Press, 1972. -Ferris, William. Local Color: A Sense of Place in Folk Art. New York: McGraw Hill, 1982. -Relph, Edward. Place and Placelessness. London: Pion, 1976. -Aguado López, Clara. “¿Quién mató a Manfred?”, Cobeta.org (2003), http://www.cobeta.org/Nuestros%20Artistas/manfred.htm. Downloaded March 10, 2011. 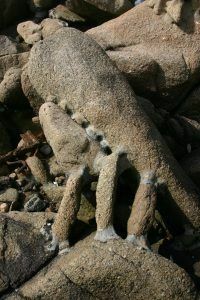 -“Hermit sculptor ‘killed by oil spill’”, BBC News (2002), http://news.bbc.co.uk/2/hi/europe/2613343.stm Downloaded March 3, 2011. -Ducrocq, Isabelle. “L’homme qui est mort de chagrin”, France 5 (2008), http://www.france5.fr/programmes/articles/sciences/636-l-homme-qui-est-mort-de-chagrin.php Downloaded March 3, 2010.